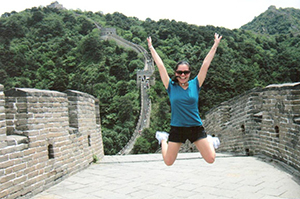 Notre Dame International at the University of Notre Dame will launch four new short-term study abroad programs for summer 2015: South Africa for Student-Athletes, Summer Greece, China Summer Language Program and Global Gateway seminars for rising freshmen. This expansion of program offerings marks progress toward NDI’s — and the University’s — goal to provide every eligible undergraduate with an opportunity to study abroad. Notre Dame is consistently ranked among the nation’s top universities for undergraduate study abroad participation and sends more than half of its students abroad before graduation. While the traditional model of a semester or academic year abroad remains the standard, class schedules, athletics and work commitments can make these longer programs inaccessible to many students. NDI’s summer offerings, including long-standing six-week programs in London and Dublin, are diverse in scope and targeted to student needs and interests. Nearly 350 students will study abroad on NDI programs this summer, with a quarter of those attending one of the four debut programs. In mid-May, 16 student-athletes will go to South Africa for a three-week, faculty-led exploration of racism and the role sports played in the transition from apartheid government to democracy. In June, 13 students will fly to Greece for a faculty-led seminar in Ancient Corinth to experience archaeological sites and museums in ways denied to tourists. Also in June, 23 students will embark on an eight-week intensive language program at Peking University in Beijing, where they will practice Chinese with PKU undergraduates. Now entering its second year, the popular Ireland Inside Track program will provide 98 students with an intensive eight-day encounter with Irish society, culture and economy. Notre Dame International advances international study, exchange and scholarship by cultivating Notre Dame’s global alliances and partnerships. Its vision is to guide and support Notre Dame in achieving the goal of becoming a preeminent global university that is distinguished by its Catholic character. Originally published by Amanda Skofstad at news.nd.edu on May 13, 2015.